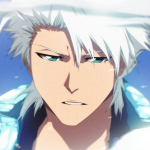 About Me RP as Tōshirō Hitsugaya from Bleach. in the topic Devil May Cry in the forum What are you playing? Currently I enjoy playing Devil May Cry 5. Game play, music, characters (aside Nico), setting, graphic and the stroy is great. Capcom has a good run lately. in the topic Kingdom Hearts in the forum What are you playing? Kingdom Hearts 3 was nice. Even if the end was to placed just to make all the important characters appear and have an happy end. At least we'll getting some more content. Can't wait to see some new world getting added there.